I know it's already been mentioned by joecool, but anyway, I just got this build up and running. It's not the beta 3, I think, just another internal build. The look&feel is identical to previous betas, the new features/improvements have to be looked for underneath the surface. Interesting to note: The image contains only Enterprise and Enterprise Core, the older images also had Standard and Datacenter editions in them. Last edited by empireum on Sun Dec 24, 2006 10:28 am, edited 1 time in total. maybe datacenter is going x64 and being centro? Uh no centro is much different. I don't think this is true either. In previous builds, or at least in 5384 and later, there has always been a Datacenter release. But I'll check if Datacenter is contained in the x64 ISO as I have just finished downloading it. But this wouldn't explain why Standard is missing as well. You can only decide between Enterprise and Enterprise Core. edit: No Standard or Datacenter in #6001 x64 either. 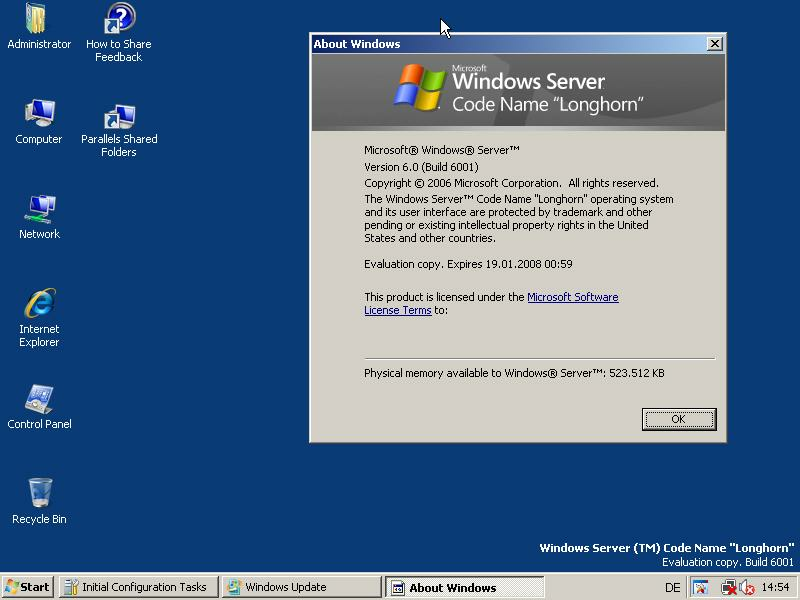 Just uploaded some Screens under Longhorn Server Enterprise 6001. Ah, thanks. I was wanting to do that, but kept forgetting it. I'll see what I can add to your shots, then. The upload will be done by 10:40pm GMT. This file is now available on the FTP server. The link is in post 1. I have about 50 peers connected, of whom all have around 75%..
the d/l of this, now it's back to 1.4 to 1..
Last edited by KenOath on Sun Dec 24, 2006 12:52 pm, edited 2 times in total. Why don't you download it from the FTP? Itll be much quicker and no need to share back as much as you do with torrents. I never had access to your server up until your email earlier on today..
though as it stays on for 8 to 9 hours every night anyhow, usually seeding.. I only just saw you had requested access just earlier so thats why you never had access. You should have contacted me about it. thats why you never had access. You should have contacted me about it. Its no bother really. Im the admin of the site, im here to bug whether I like it or not!